George Spanoudakis is Professor of Software Engineering at City University London and Director of the Centre of Adaptive Computing Systems (CeNACS). He holds a BSc degree in Informatics (Athens University of Economics & Business Science, 1988), an MSc degree in Advanced Methods in Computer Science (Queen Mary College-University of London, 1989) and a PhD in Computer Science (University of Crete, 1994). Prior to his current post, he had been a lecturer (1997-99), senior lecturer (1999-2004) and reader (2004-06) at City University. He had also been Head of the Department of Computing at City (2004-2007), Associate Dean for Research of the School of Informatics at City (2010-2014) and member of the Council of University of Piraeus (2013-17). 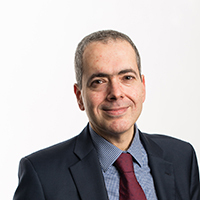 Professor Spanoudakis has also also held visiting posts at University of Crete (1999), London School of Economics (1999), University of Essen (2001), University of Malaga (2008), ICS-FORTH (2016) and the University of Cyprus (2017). Professor Spanoudakis works in the broad field of software systems engineering. In 2000, he established the Software Engineering Research Group at City research group (SE@City) and led it until 2014 when the group became part of the Centre for Adaptive Computing Engineering (CeNACS). His current research interests focus on software systems security (with particular focus on assessing system security compliance and risk, security certification and security-by-design) and biomedical computing. He has published extensively in the areas of his research (more than 150 peer reviewed publications) and has obtained more than 67.5m Euro in collaborative research funding (7.3m to own research). He has also been the principal investigator of several research projects including the EU Horizon 2020 projects CYBERSURE (2017-20), EVOTION (2016-19) and TOREADOR (2016-2018); the EU F7 projects EMBalance (Dec 2013 - Nov 2016), CUMULUS (Certification Infrastructure for Multi-Layer Cloud Services, Oct 2012- Sep 2015), ASSERT4SOA (Advanced Security Service Certificates for SOA, 2010-13), IoT-at-Work (IoT technology in manufacturing, 2010-2013, co investigator), S-CUBE (Software, Systems and Services Network of Excellence, 2008-12) and SLA@SOI (Empowering the Service Economy with SLA-aware Infrastructures, 2008-11); and the EU F6 projects SERENITY (Systems Engineering for Security and Dependability, 2006-08), PEPERS (Mobile Peer-to-Peer Security Infrastructure, 2006-08), SECSE (Service-centric System Engineering, 2004-2008), GREDIA (2006-2009, co-investigator), and the EPSRC project IMOOSD (1999-2000). Beyond research, he has been providing consultancy advice to private companies, public funding bodies, universities and standardisation bodies. He has also been serving as a member of the editorial boards of international journals, including Int. Journal of Software Engineering and Knowledge Engineering, Int. Journal Of Web Services Research, Int. Journal Of Service Computing, Int. Journal On Advances in Intelligent Systems, Int. Journal On Advances in Security, and Int. Journal On Advances in Software , and the programme committees of more than 180 international conferences and workshops. He has also chaired SEKE 2006, SEKE 2007, IE4SOC 2009, AWC 2014, ENASE 2017 and ENASE 2018. Further information: Research Area: mobile systems security, Date of start 01 Oct 2012. Further information: Research Area: cloud computing, security, Date of start 01 Nov 2013. Further information: Research Area: cloud computing, security, Date of start 01 Feb 2013. Further information: Research Area: security certification, cloud computing, Date of start 01 Jun 2013. Further information: Research Area: networks and sensors security, Date of start 01 Mar 2013. Damiani, E., Spanoudakis, G. and Maciaszek, L. (2018). Preface. ISBN 978-3-319-94134-9. Ferreira, J.E., Spanoudakis, G., Ma, Y. and Zhang, L.J. (2018). Preface. ISBN 978-3-319-94375-6. Spanoudakis, G., Mana, A. and Kokolakis, S. (2009). Security and Dependability for Ambient Intelligence. Springer-Verlag New York Inc. ISBN 978-0-387-88774-6. Damiani, E., Spanoudakis, G. and Maciaszek, L. (2018). Foreword. (p. IX). ISBN 978-989-758-300-1. Katopodis, S., Spanoudakis, G. and Mahbub, K. (2014). Towards hybrid cloud service certification models. 2014 IEEE International Conference on Services Computing (SCC) (pp. 394–399). IEEE. ISBN 978-1-4799-5066-9. Palacios, M., García-Fanjul, J., Tuya, J. and Spanoudakis, G. (2012). Identifying test requirements by analyzing SLA guarantee terms. (pp. 351–358). ISBN 978-0-7695-4752-7. Foster, H. and Spanoudakis, G. (2011). SMaRT: A Workbench for reporting the monitorability of services from SLAs. Proceedings of the 3rd International Workshop on Principles of Engineering Service-Oriented Systems (pp. 36–42). New York: ACM. ISBN 978-1-4503-0591-4. Lorenzoli, D. and Spanoudakis, G. (2011). Predicting software service availability: Towards a runtime monitoring approach. 2011 IEEE International Conference on Web Services (ICWS 2011) (pp. 736–737). IEEE. ISBN 978-1-4577-0842-8. Spanoudakis, G. and Zisman, A. (2011). Designing and Adapting Service-based Systems: A Service Discovery Framework. (pp. 261–297). SPRINGER-VERLAG BERLIN. ISBN 978-3-7091-0414-9. Pazzaglia, J.C., Lotz, V., Campos Cerda, V., Damiani, E., Ardagna, C., Giirgens, S. … Menicocci, R. (2011). Advanced security service certificate for SOA: Certified services go digital! In Pohlmann, N., Reimer, H. and Schneider, W. (Eds. ), ISSE 2010 Securing Electronic Business Processes (pp. 151–160). Germany: Spinger. ISBN 978-3-8348-1438-8. Zisman, A. and Spanoudakis, G. (2010). A Service Discovery Framework. In Dustdar, S. and Li, F. (Eds. ), Service Engineering (pp. 261–298). Springer-Verlag New York Inc. ISBN 978-3-7091-0414-9. Spanoudakis, G., Mana, A. and Kokolakis, S. (2009). The SERENITY vision. In Spanoudakis, G., Mana, A. and Kokolakis, S. (Eds. ), Security and Dependability for Ambient Intelligence (pp. 1–18). Springer-Verlag New York Inc. ISBN 978-0-387-88774-6. Spanoudakis, G., Mana, A. and Kokolakis, S. (2009). SERENITY: Future Directions, In Security and Dependability for Ambient Intelligence. In Spanoudakis, G., Mana, A. and Kokolakis, S. (Eds. ), Security and Dependability for Ambient Intelligence (pp. 379–384). Springer-Verlag New York Inc. ISBN 978-0-387-88774-6. Di Penta, M., Bastida, L., Sillitti, A., Baresi, L., Maiden, N., Melideo, M. … Ripa, G. (2009). SeCSE – Service-Centric Systems Engineering – An Overview. In Nitto, E.D., Programme, I.S.T., Sassen, A.-.M., Traverso, P. and Zwegers, A. (Eds. ), At your service: Service-Oriented Computing from an EU Perspective (pp. 241–271). The MIT Press. ISBN 978-0-262-04253-6. Zisman, A., Dooley, J. and Spanoudakis, G. (2009). Runtime Service Discovery for Grid Applications. In Bessis, N. (Ed. ), Grid Technology for Maximizing Collaborative Decision Management and Support: Advancing Effective Virtual Organizations Information Science Reference. ISBN 978-1-60566-364-7. Comuzzi, M. and Spanoudakis, G. (2009). A framework for hierarchical and recursive monitoring of service based systems. Fourth International Conference on Internet and Web Applications and Services, 2009. ICIW '09. (pp. 383–388). IEEE. ISBN 978-0-7695-3613-2. Maña, A., Spanoudakis, G. and Kokolakis, S. (2009). Introduction: The SERENITY vision. In Kokolakis, S., Gómez, A.M. and Spanoudakis, G. (Eds. ), Security and Dependability for Ambient Intelligence (pp. 1–18). Springer. ISBN 978-0-387-88774-6. Maña, A., Spanoudakis, G. and Kokolakis, S. (2009). Future Directions. In Kokolakis, S., Gómez, A.M. and Spanoudakis, G. (Eds. ), Security and Dependability for Ambient Intelligence (pp. 379–383). Springer. ISBN 978-0-387-88774-6. Spanoudakis, G., Maña, A. and Kokolakis, S. (2009). Preface. ISBN 978-0-387-88774-6. Zisman, A., Kozlenkov, A., Spanoudakis, G., Fasoulas, V. and Sanchez, F. (2008). Architecture-driven Service Discovery for Service Centric Systems. In Anttiroiko, A.-.V. (Ed. ), Electronic government: Concepts, Methodologies, Tools, and Applications (pp. 811–842). ISBN 978-1-59904-947-2. Spanoudakis, G. and Mahbub, K. (2007). Monitoring WS Agreements: An Event Calculus Based Approach. In Baresi, L. and Nitto, E.D. (Eds. ), Test and analysis of Web services (pp. 265–306). Springer-Verlag New York Inc. ISBN 978-3-540-72911-2. Spanoudakis, G., Mana, A., Rudolph, C., Lotz, V., Massaci, F., Melideo, M. … Lσpez-Cobo, J. (2007). 13. Security Engineering for Ambient Intelligence: A Manifesto. In Mouratidis, H. and Giorgini, P. (Eds. ), Integrating security and software engineering (pp. 244–270). Idea Group Pub. ISBN 978-1-59904-147-6. Mana, A., Rudolph, C., Spanoudakis, G., Lotz, V., Massacci, F., Melideo, M. … Lopez-Cobo, J.S. (2007). Security Engineering for Ambient Intelligence: A Manifesto. (pp. 244–270). IDEA GROUP PUBLISHING. Zisman, A. and Spanoudakis, G. (2005). Software Traceability. In Chang, S.K. (Ed. ), Handbook of Software Engineering & Knowledge Engineering (pp. 395–428). World Scientific Pub Co Inc. ISBN 978-981-256-273-9. Spanoudakis, G. and Zisman, A. (2005). SOFTWARE TRACEABILITY: A ROADMAP. In Chang, S.K. (Ed. ), (pp. 395–428). WORLD SCIENTIFIC PUBL CO PTE LTD. ISBN 978-981-256-273-9. Zisman, A. and Spanoudakis, G. (2002). Inconsistency Management in Software Engineering: Survey and Open Research Issues. In Chang, S.K. (Ed. ), Handbook of software engineering & knowledge engineering (pp. 329–380). ISBN 978-981-02-4973-1. Petroulakis, N.E., Spanoudakis, G. and Askoxylakis, I.G. (2018). Fault Tolerance Using an SDN Pattern Framework. Ye, B., Basdekis, I., Smyrlis, M., Spanoudakis, G. and Koloutsou, K. (2018). A big data repository and architecture for managing hearing loss related data. Spanoudakis, G., Katrakazas, P., Koutsouris, D., Kikidis, D., Bibas, A. and Pontopidan, N.H. (2018). Public health policy for management of hearing impairments based on big data analytics: EVOTION at genesis. Hatzivasilis, G., Askoxylakis, I., Alexandris, G., Anicic, D., Broring, A., Kulkarni, V. … Spanoudakis, G. (2018). The Interoperability of Things: Interoperable solutions as an enabler for IoT and Web 3.0. Soultatos, O., Spanoudakis, G., Fysarakis, K., Askoxylakis, I., Alexandris, G., Miaoudakis, A. … Nikolaos Petroulakis, E. (2018). Towards a Security, Privacy, Dependability, Interoperability Framework for the Internet of Things. Fysarakis, K., Petroulakis, N.E., Roos, A., Abbasi, K., Vizarreta, P., Petropoulos, G. … Askoxylakis, I. (2017). A Reactive Security Framework for operational wind parks using Service Function Chaining. Prasinos, M., Spanoudakis, G. and Koutsouris, D. (2017). Towards a model-driven platform for evidence based public health policy making. Damiani, E., Spanoudakis, G. and Maciaszek, L. (2017). Foreword. Spanoudakis, G., Katrakazas, P., Koutsouris, D., Kikkidis, D., Bibas, A., Pontoppidan, N.H. … IEEE, (2017). Public health policy for management of hearing impairments based on big data analytics: EVOTION at Genesis. Exarchos, T.P., Rigas, G., Bibas, A., Kikidis, D., Nikitas, C., Wuyts, F.L. … Fotiadis, D.I. (2016). Multiparametric data analysis for diagnostic decision support in balance disorders. Hudic, A., Tauber, M., Lorunser, T., Krotsiani, M., Spanoudakis, G., Mauthe, A. … Weippl, E.R. (2015). A multi-layer and multitenant cloud assurance evaluation methodology. Anwer, A., Prasinos, M., Bamiou, D.E., Macdonald, N., Pavlou, M., Exarchos, T.P. … Luxon, L. (2015). EMBalance data repository modeling and clinical application. Exarchos, T.P., Stefanou, K., Rigas, G., Bibas, A., Kikidis, D., Nikitas, C. … Fotiadis, D.I. (2015). Diagnosis of balance disorders using decision support systems based on data mining techniques. Petroulakis, N.E., Spanoudakis, G., Askoxylakis, I.G., Miaoudakis, A. and Traganitis, A. (2015). A pattern-based approach for designing reliable cyber-physical systems. Rahulamathavan, Y., Rajarajan, M., Pawar, P.S., Rana, O.F., Burnap, P. and Spanoudakis, G. (2014). Analysing security requirements in cloud-based service level agreements. Foster, H., Spanoudakis, G. and Mahbub, K. (2012). Formal certification and compliance for run-time service environments. 2012 IEEE Ninth International Conference on Services Computing (SCC) 24-19 June, Honolulu, USA. Spanoudakis, G., Damiani, E. and Maña, A. (2012). Certifying Services in Cloud: The Case for a Hybrid, Incremental and Multi-layer Approach. Spanoudakis, G. and Lorenzoli, D. (2011). Runtime Prediction of Software Service Availability. 2. 2011 International Conference on Software Engineering Research and Practice (SERP'11) 18-21 July, USA. Spanoudakis, G. and Mahbub, K. (2011). Proactive SLA Negotiation for Service Based Systems: Initial Implementation and Evaluation Experience. 8th IEEE International Conference on Services Computing July. Spanoudakis, G. and Lorenzoli, D. (2011). Predicting Software Service Availability: Towards a Runtime Monitoring Approach. 3. IEEE 9th International Conference on Web Services (Work-in-Progress track) July. Mahbub, K., Spanoudakis, G. and Zisman, A. (2011). A monitoring approach for runtime service discovery. Spanoudakis, G. and Foster, H. (2010). Model-Driven Service Monitoring Configuration with Formal SLA Decomposition and Selection. 6. 4th International Symposium On Leveraging Applications of Formal Methods, Verification and Validation October. Spanoudakis, G. and Comuzzi, M. (2009). Describing and Verifying Monitoring Capabilities for Service Based Systems. Proceedings of the CAiSE 2009 Forum June, Netherlands. Zisman, A., Spanoudakis, G. and Dooley, J. (2009). A Query Language for Service Discovery. Spanoudakis, G. and Tsigritis, T. (2008). Diagnosing Runtime Violations of Security & Dependability Properties. 20th International Conference on Software Engineering and Knowledge Engineering July. Spanoudakis, G. and Androutsopoulos, K. (2008). Monitoring Security and Dependability in Mobile P2P Systems. 3rd International Conference for Internet Technology and Secured Transactions (ICITST '08) 23-28 June, Dublin, Ireland. Siveroni, I., Zisman, A. and Spanoudakis, G. (2008). Property Specification and Static Verification of UML Models. Zisman, A., Dooley, J. and Spanoudakis, G. (2008). Proactive Runtime Service Discovery. Zisman, A., Spanoudakis, G. and Dooley, J. (2008). A Framework for Dynamic Service Discovery. Tsigkritis, T. and Spanoudakis, G. (2008). A Temporal Abductive Diagnostic Process for Runtime Properties Violations. Spanoudakis, G., Mahbub, K. and Zisman, A. (2007). A Platform for Context Aware Runtime Web Service Discovery. Zisman, A., Mahbub, K. and Spanoudakis, G. (2007). A Service Discovery Framework based on Linear Composition. Spanoudakis, G., Zhang, K. and Visaggio, G. (2006). Proceedings of the Eighteenth International Conference on Software Engineering & Knowledge Engineering. SEKE'2006 5-7 July, San Francisco, CA, USA. Zisman, A., Kozlenkov, A., Fasoulas, V., Sanchez, F. and Spanoudakis, G. (2006). A Framework for Architecture-driven Service Discovery. International Workshop on Service Oriented Software Engineering (IW-SOSE'06), ICSE 2006 27-28 May, Shanghai. Zisman, A. and Spanoudakis, G. (2006). UML-Based Service Discovery Framework. Spanoudakis, G. and Zisman, A. (2006). UML-based Service Discovery Tool. (2006). Proceedings of the Eighteenth International Conference on Software Engineering & Knowledge Engineering (SEKE'2006), San Francisco, CA, USA, July 5-7, 2006. Zisman, A., Jones, S., Kozlenkov, A., Mahbub, K., Maiden, N., Spanoudakis, G. … Zhu, X. (2005). Service Discovery for Service Centric Systems. eChallenges 2005 19-21 October, Ljubljana, Slovenia. Spanoudakis, G., Zisman, A. and Kozlenkov, A. (2005). A Service Discovery Framework for Service Centric Systems. Spanoudakis, G. and Zisman, A. (2005). Guest Editors' Introduction. Spanoudakis, G., Garcez, A.D. and Zisman, A. (2003). Revising Rules to Capture Requirements Traceability Relations: A Machine Learning Approach. Fifteenth International Conference on Software Engineering and Knowledge Engineering (SEKE'03) July, San Francisco. Zisman, A., Cysneiros, G. and Spanoudakis, G. (2003). A Traceability Approach for i* and UML Models. 2nd International Workshop on Software Engineering for Large-Scale Multi-Agent Systems (ICSE 2003) 3-4 May, Portland. Zisman, A., Mella, J., Nurse, D. and Spanoudakis, G. (2003). Using Web-services to Support Legal Clinical Systems. Proceedings of the Health Care March, UK. Zisman, A., Spanoudakis, G., Pérez-Miñana, E. and Krause, P. (2003). Tracing Software Requirements Artifacts. Spanoudakis, G., Zisman, A. and Garcez, A. (2003). Proceedings of Workshop on Intelligent Technologies for Software Engineering (WITSE03). In conjunction with the 9th European Software Engineering Conference and the 11th Symposium on Foundations of Software Engineering. Zisman, A., Spanoudakis, G., Pérez-Miñana, E. and Krause, P. (2002). Towards a Traceability Approach for Product Families Requirements. 3rd International Workshop on Software Product Lines: Economics, Architectures and Implications (ICSE 2002) May. Spanoudakis, G., Zisman, A. and Perez-Minana, E. (2002). Proceedings of the 1st International Workshop on Traceability in Emerging Forms of Software Engineering (TEFSE’02). In conjunction with the 17th IEEE International Conference on Automated Software Engineering. Spanoudakis, G. and Kim, H. (2001). Reconciliation of object interaction models. Spanoudakis, G. and Kassis, K. (2000). An Evidential Framework for Diagnosing the Significance of Inconsistencies in UML Models. International Conference on Software: Theory and Practice, World Computer Congress 2000 August, Bejing, China. Spanoudakis, G. and Kim, H. (2000). Quantitative Assessment of the Significance of Inconsistencies in Object-Oriented Designs. 4th International ECOOP Workshop on Quantitative Approaches in Object-Oriented Software Engineering June. Spanoudakis, G. and Zisman, A. (2000). Information Monitors: An Architecture Based on XML. Spanoudakis, G. and Finkelstein, A. (1998). A semi-automatic process of identifying overlaps and inconsistencies between requirements specifications. Spanoudakis, G. and Finkelstein, A. (1997). Overlaps among Requirement Specifications. ICSE ‘97 Workshop on Living with Inconsistency May, Boston, USA. Spanoudakis, G., Finkelstein, A. and Till, D. (1996). Managing Interference. SIGSOFT ‘96 Workshops October, San Francisco, USA. Spanoudakis, G. and Finkelstein, A. (1996). Reconciliation: Managing Interference in Software Development. ECAI '96 Workshop on Managing Conflict in AI 13 Aug 1996 – 13 Aug 1993, Budapest, Hungary. Spanoudakis, G., Emmerich, W. and Finkelstein, A. (1996). Next-Generation Viewpoint-based Environments. 7th Workshop on Next Generation of CASE Tools May, Heraklion, Greece. Spanoudakis, G., Finkelstein, A. and Ryan, M. (1996). Software Package Requirements and Procurement. 8th International Workshop on Software Specification and Design March, Schloss Velen, Germany. Spanoudakis, G., Vidal, L., Finkelstein, A. and Wofl, A. (1996). Joint Proceedings of the SIGSOFT '96 Workshops. MAIDEN, N.A.M., ASSENOVA, P., CONSTANTOPOULOS, P., JARKE, M., JOHANNESON, P., NISSEN, H.W. … INST, K.S. (1995). Computational mechanisms for distributed requirements engineering. Spanoudakis, G. and Constantopoulos, P. (1994). Integrating Specifications. Dagstuhl Seminar on Systems Requirements Analysis - Management & Exploitation 4-7 October, Schloss Dagstuhl, Germany. Spanoudakis, G., Constantopoulos, P. and Kyprioti, M. (1994). Similarity Analysis for Process Modeling of Requirements Engineering. 4-7 October, Schloss Dagstuhl, Germany. Spanoudakis, G. and Constantopoulos, P. (1994). Similarity for Analogical Software Reuse: A Computational Model. 11th European Conference on Artificial Intelligence (ECAI '94) August, Amsterdam, The Netherlands. Spanoudakis, G. and Constantopoulos, P. (1994). Measuring Similarity Between Software Artifacts. 6th International Conference on Software Engineering & Knowledge Engineering (SEKE '94) June, Jurmala, Latvia. Pohl, K., Assenova, P., Doemges, R., Johannesson, P., Maiden, N., Plihon, V. … Spanoudakis, G. (1994). Applying AI Techniques to Requirements Engineering: the Nature Prototype. AI/SE Workshop, 16th International Software Engineering Conference 16-21 May, Sorrento. Spanoudakis, G. and Constantopoulos, P. (1994). On Evidential Feature Salience. 5th International Conference on Database & Expert Systems Applications (DEXA '94). Spanoudakis, G., Papadourakis, G. and Gotzias, A. (1993). Application of Neural Networks in Short-Term Stock Price Forecasting. 1st International Workshop on Neural Networks in the Capital Markets 18-19 November, London. Jarke, M., Pohl, K., Jacobs, S., Bubenko, J., Assenova, P., Holm, P. … Spanoudakis, G. (1993). Requirements Engineering: an Integrated View of Representation, Process and Domain. 4th European Software Engineering Conference 13-17 September, Garmesh-Partenkirchen. Spanoudakis, G., Papadourakis, G. and Gotzias, A. (1993). Stock Price Forecasting using Neural Networks. NEURONET '93 September, Prague. Spanoudakis, G. and Constantopoulos, P. (1993). Similarity for Analogical Software Reuse: A Conceptual Modeling Approach. 5th International Conference on Advanced Information Systems Engineering (CAiSE '93) June, Paris. Spanoudakis, G. and Constantopoulos, P. (1992). Similarity for Analogical Software Reuse: A Conceptual Modeling Approach. ERCIM Workshop on Methods and Tools for Software Reuse October, Heraklion, Crete, Greece. Spanoudakis, G. and Morris, S. UML: An Evaluation of the Visual Syntax of the Language. 41. 34th International Conference on Systems Sciences (HICSS'01) Los Alamitos, CA. Petroulakis, N.E., Fysarakis, K., Askoxylakis, I. and Spanoudakis, G. (2018). Reactive security for SDN/NFV-enabled industrial networks leveraging service function chaining. Transactions on Emerging Telecommunications Technologies, 29(7). doi:10.1002/ett.3269 . Koloutsou, K., Kikidis, D., Spanoudakis, G., Bibas, A. and Nikolopoulos, T. (2017). Speech audiometry test with picture-related sentence lists in Modern Greek for partially hearing children. Hearing, Balance and Communication, 15(4), pp. 187–198. doi:10.1080/21695717.2017.1389176 . Pino, L., Spanoudakis, G., Krotsiani, M. and Mahbub, K. (2017). Pattern Based Design and Verification of Secure Service Compositions. IEEE Transactions on Services Computing pp. 1–1. doi:10.1109/tsc.2017.2690430 . Tietz, L.H.B., Katrakazas, P., Laplante-Lévesque, A., Pontoppidan, N.H., Koloutsou, N., Spanoudakis, G. … Koutsouris, D. (2017). Associations between hearing performance and physiological measures - An overview and outlook. Studies in Health Technology and Informatics, 238, pp. 100–103. doi:10.3233/978-1-61499-781-8-100 . Anisetti, M., Ardagna, C.A., Damiani, E., Mana, A. and Spanoudakis, G. (2017). Towards Transparent and Trustworthy Cloud. IEEE Cloud Computing, 4(3), pp. 40–48. doi:10.1109/MCC.2017.51 . Petroulakis, N.E., Spanoudakis, G. and Askoxylakis, I.G. (2016). Patterns for the design of secure and dependable software defined networks. Computer Networks, 109, pp. 39–49. doi:10.1016/j.comnet.2016.06.028 . Exarchos, T.P., Rigas, G., Bibas, A., Kikidis, D., Nikitas, C., Wuyts, F.L. … Fotiadis, D.I. (2016). Mining balance disorders' data for the development of diagnostic decision support systems. Computers in Biology and Medicine, 77, pp. 240–248. doi:10.1016/j.compbiomed.2016.08.016 . Meng, X. and Spanoudakis, G. (2016). MBotCS: A mobile botnet detection system based on machine learning. Lecture Notes in Computer Science (including subseries Lecture Notes in Artificial Intelligence and Lecture Notes in Bioinformatics), 9572, pp. 274–291. doi:10.1007/978-3-319-31811-0_17 . Palacios, M., García-Fanjul, J., Tuya, J. and Spanoudakis, G. (2015). Coverage-Based Testing for Service Level Agreements. IEEE Transactions on Services Computing, 8(2), pp. 299–313. doi:10.1109/TSC.2014.2300486 . Palacios, M., García-Fanjul, J., Tuya, J. and Spanoudakis, G. (2015). Automatic test case generation for WS-Agreements using combinatorial testing. Computer Standards and Interfaces, 38, pp. 84–100. doi:10.1016/j.csi.2014.10.003 . Krotsiani, M. and Spanoudakis, G. (2015). Continuous certification of non-repudiation in cloud storage services. Proceedings - 2014 IEEE 13th International Conference on Trust, Security and Privacy in Computing and Communications, TrustCom 2014 pp. 921–928. doi:10.1109/TrustCom.2014.122 . Egea, M., Mahbub, K., Spanoudakis, G. and Vieira, M.R. (2015). A certification framework for cloud security properties: The monitoring path. Lecture Notes in Computer Science (including subseries Lecture Notes in Artificial Intelligence and Lecture Notes in Bioinformatics), 8937, pp. 63–77. doi:10.1007/978-3-319-17199-9_3 . Pino, L., Spanoudakis, G., Fuchs, A. and Gürgens, S. (2015). Generating secure service compositions. Communications in Computer and Information Science, 512, pp. 81–99. doi:10.1007/978-3-319-25414-2_6 . Spanoudakis, G., Marrington, A. and Iqbal, F. (2014). Security track chairs welcome message. 2014 6th International Conference on New Technologies, Mobility and Security - Proceedings of NTMS 2014 Conference and Workshops. doi:10.1109/NTMS.2014.6813990 . Pino, L., Spanoudakis, G., Fuchs, A. and Gürgens, S. (2014). Discovering secure service compositions. CLOSER 2014 - Proceedings of the 4th International Conference on Cloud Computing and Services Science pp. 242–253. Pino, L., Mahbub, K. and Spanoudakis, G. (2014). Designing secure service workflows in BPEL. Lecture Notes in Computer Science (including subseries Lecture Notes in Artificial Intelligence and Lecture Notes in Bioinformatics), 8831, pp. 551–559. Krotsiani, M., Spanoudakis, G. and Mahbub, K. (2013). Incremental certification of cloud services. SECURWARE 2013 - 7th International Conference on Emerging Security Information, Systems and Technologies pp. 72–80. Bibas, A., Spanoudakis, G., Bellos, C., Fotiadis, D.I. and Koutsouris, D. (2013). Biologically inspired near extinct system reconstruction. 13th IEEE International Conference on BioInformatics and BioEngineering, IEEE BIBE 2013. doi:10.1109/BIBE.2013.6701644 . Petroulakis, N.E., Askoxylakis, I.G., Traganitis, A. and Spanoudakis, G. (2013). A privacy-level model of user-centric cyber-physical systems. Lecture Notes in Computer Science (including subseries Lecture Notes in Artificial Intelligence and Lecture Notes in Bioinformatics), 8030 LNCS, pp. 338–347. doi:10.1007/978-3-642-39345-7-36 . Petroulakis, N.E., Tragos, E.Z., Fragkiadakis, A.G. and Spanoudakis, G. (2013). A lightweight framework for secure life-logging in smart environments. Information Security Technical Report, 17(3), pp. 58–70. doi:10.1016/j.istr.2012.10.005 . Tsigritis, T. and Spanoudakis, G. (2013). Assessing the genuineness of events in runtime monitoring of cyber systems. Computers and Security, 38, pp. 76–96. doi:10.1016/j.cose.2013.03.011 . Zisman, A., Spanoudakis, G., Dooley, J. and Siveroni, I. (2013). Proactive and Reactive Runtime Service Discovery: A Framework and Its Evaluation. IEEE Transactions on Software Engineering, 39(7), pp. 954–974. doi:10.1109/TSE.2012.84 . Foster, H., Spanoudakis, G. and Mahbub, K. (2012). Formal certification and compliance for run-time service environments. Proceedings - 2012 IEEE 9th International Conference on Services Computing, SCC 2012 pp. 17–24. doi:10.1109/SCC.2012.23 . Pino, L. and Spanoudakis, G. (2012). Constructing secure service compositions with patterns. Proceedings - 2012 IEEE 8th World Congress on Services, SERVICES 2012 pp. 184–191. doi:10.1109/SERVICES.2012.61 . Pino, L. and Spanoudakis, G. (2012). Finding secure compositions of software services: Towards a pattern based approach. 2012 5th International Conference on New Technologies, Mobility and Security - Proceedings of NTMS 2012 Conference and Workshops. Foster, H. and Spanoudakis, G. (2012). Taming the cloud: Safety, certification and compliance for software services - Keynote at the Workshop on Engineering Service-Oriented Applications (WESOA) 2011. Lecture Notes in Computer Science (including subseries Lecture Notes in Artificial Intelligence and Lecture Notes in Bioinformatics), 7221 LNCS, pp. 3–8. Mahbub, K. and Spanoudakis, G. (2011). Proactive SLA negotiation for service based systems: Initial implementation and evaluation experience. Proceedings - 2011 IEEE International Conference on Services Computing, SCC 2011 pp. 16–23. doi:10.1109/SCC.2011.34 . Damiani, E., Gürgens, S., Maña, A., Spanoudakis, G. and Ardagna, C.A. (2011). Journal of Systems Architecture: Editorial. Journal of Systems Architecture, 57(3), pp. 229–230. doi:10.1016/j.sysarc.2011.02.003 . Damiani, E., Guergens, S., Mana, A., Spanoudakis, G. and Ardagna, C.A. (2011). Special Issue on Security and Dependability Assurance of Software Architectures. JOURNAL OF SYSTEMS ARCHITECTURE, 57(3), pp. 229–230. doi:10.1016/j.sysarc.2011.02.003 . Foster, H. and Spanoudakis, G. (2011). Advanced service monitoring configurations with SLA decomposition and selection. Proceedings of the ACM Symposium on Applied Computing pp. 1582–1589. Bezzi, M., Sabetta, A. and Spanoudakis, G. (2011). An architecture for certification-aware service discovery. Proceedings - 2011 1st International Workshop on Securing Services on the Cloud, IWSSC 2011 pp. 14–21. Anisetti, M., Ardagna, C.A., Guida, F., Gürgens, S., Lotz, V., Maña, A. … Spanoudakis, G. (2010). ASSERT4SOA: Toward security certification of service-oriented applications. Lecture Notes in Computer Science (including subseries Lecture Notes in Artificial Intelligence and Lecture Notes in Bioinformatics), 6428 LNCS, pp. 38–40. doi:10.1007/978-3-642-16961-8_11 . Lorenzoli, D. and Spanoudakis, G. (2010). EVEREST+: Run-time SLA violations prediction. Proceedings of the 5th Workshop on Middleware for Service Oriented Computing, MW4SOC 2010, Held at the ACM/IFIP/USENIX International Middleware Conference pp. 13–18. doi:10.1145/1890912.1890915 . Mahbub, K. and Spanoudakis, G. (2010). A framework for proactive SLA negotiation. ICSOFT 2010 - Proceedings of the 5th International Conference on Software and Data Technologies, 2, pp. 251–256. Mahbub, K. and Spanoudakis, G. (2010). Proactive SLA negotiation for service based systems. Proceedings - 2010 6th World Congress on Services, Services-1 2010 pp. 519–526. doi:10.1109/SERVICES.2010.15 . Comuzzi, M. and Spanoudakis, G. (2010). Dynamic set-up of monitoring infrastructures for service based systems. Proceedings of the ACM Symposium on Applied Computing pp. 2414–2421. doi:10.1145/1774088.1774591 . Baresi, L., Guinea, S., Nano, O. and Spanoudakis, G. (2010). Comprehensive monitoring of BPEL processes. IEEE Internet Computing, 14(3), pp. 50–57. doi:10.1109/MIC.2010.66 . Siveroni, I., Zisman, A. and Spanoudakis, G. (2010). A UML-based static verification framework for security. Requir. Eng., 15, pp. 95–118. Spanoudakis, G. and Zisman, A. (2010). Discovering Services during Service-Based System Design Using UML. IEEE Trans. Software Eng., 36, pp. 371–389. doi:10.1109/TSE.2009.88 . Comuzzi, M., Kotsokalis, C., Spanoudakis, G. and Yahyapour, R. (2009). Establishing and monitoring slas in complex service based systems. 2009 IEEE International Conference on Web Services, ICWS 2009 pp. 783–790. doi:10.1109/ICWS.2009.47 . Spanoudakis, G. and LoPresti, S. (2009). Web service trust: Towards a dynamic assessment framework. Proceedings - International Conference on Availability, Reliability and Security, ARES 2009 pp. 33–40. doi:10.1109/ARES.2009.149 . Lorenzoli, D. and Spanoudakis, G. (2009). Detection of security and dependability threats: A belief based reasoning approach. Proceedings - 2009 3rd International Conference on Emerging Security Information, Systems and Technologies, SECURWARE 2009 pp. 312–320. Amálio, N. and Spanoudakis, G. (2008). From monitoring templates to security monitoring and threat detection. Proceedings - 2nd Int. Conf. Emerging Security Inf., Systems and Technologies, SECURWARE 2008, Includes DEPEND 2008: 1st Int. Workshop on Dependability and Security in Complex and Critical Inf. Sys. pp. 185–192. doi:10.1109/SECURWARE.2008.58 . Spanoudakis, G. (2007). Dynamic trust assessment of software services. IW-SOSWE'07: 2nd International Workshop on Service Oriented Software Engineering - In conjunction with the 6th ESEC/FSE Joint Meeting pp. 36–40. doi:10.1145/1294928.1294937 . Koulouris, T., Spanoudakis, G. and Tsigkritis, T. (2007). Towards a framework for dynamic verification of peer-to-peer systems. Second International Conference on Internet and Web Applications and Services, ICIW'07. doi:10.1109/ICIW.2007.63 . Zhang, K., Spanoudakis, G. and Visaggio, G. (2007). International Journal of Software Engineering and Knowledge Engineering: Guest editors' introduction. International Journal of Software Engineering and Knowledge Engineering, 17(2), pp. 167–169. doi:10.1142/S0218194007003203 . Hira, R., Diestet, O., Spanoudakis, G., Visaggios, G., Wirtzit, G. and Chang, S.K. (2007). It-outsourcing and it-offshoring: Trends and impacts on SE/KE curricula. International Journal of Software Engineering and Knowledge Engineering, 17(5), pp. 663–685. doi:10.1142/S0218194007003409 . Kozlenkov, A., Spanoudakis, G., Zisman, A., Fasoulas, V. and Sanchez, F. (2007). Architecture-Driven Service Discovery for Service Centric Systems. Int. J. Web Service Res., 4, pp. 82–113. Zhang, K., Spanoudakis, G. and Visaggio, G. (2007). Guest Editors: Introduction. International Journal of Software Engineering and Knowledge Engineering, 17, pp. 167–169. Zhang, K., Spanoudakis, G. and Visaggio, G. (2006). SEKE'2006 foreword. 18th International Conference on Software Engineering and Knowledge Engineering, SEKE 2006. Spanoudakis, G. and Mahbub, K. (2006). Non-intrusive monitoring of service-based systems. International Journal of Cooperative Information Systems, 15(3), pp. 325–358. doi:10.1142/S0218843006001384 . Mahbub, K. and Spanoudakis, G. (2005). Run-time monitoring of requirements for systems composed of Web-services: Initial implementation and evaluation experience. Proceedings - 2005 IEEE International Conference on Web Services, ICWS 2005, 2005, pp. 257–265. doi:10.1109/ICWS.2005.100 . Mahbub, K. and Spanoudakis, G. (2004). A framework for requirements monitoring of service based systems. ICSOC '04: Proceedings of the Second International Conference on Service Oriented Computing pp. 84–93. Spanoudakis, G. and Mahbub, K. (2004). Requirements monitoring for service-based systems: Towards a framework based on event calculus. Proceedings - 19th International Conference on Automated Software Engineering, ASE 2004 pp. 379–384. doi:10.1109/ASE.2004.1342769 . Spanoudakis, G., Kasis, K. and Dragazi, F. (2004). Evidential diagnosis of inconsistencies in object-oriented designs. International Journal of Software Engineering and Knowledge Engineering, 14(2), pp. 141–178. doi:10.1142/S0218194004001610 . Spanoudakis, G., Zisman, A., Pérez-Miñana, E. and Krause, P. (2004). Rule-based generation of requirements traceability relations. Journal of Systems and Software, 72, pp. 105–127. Spanoudakis, G. and Kim, H. (2004). Supporting the Reconciliation of Models of Object Behavior. 8. International Journal of Software and Systems Modeling, 3(4), pp. 273–293. doi:10.1007/s10270-004-0054-1 . Zisman, A. and Spanoudakis, G. (2003). Proceedings of the 2nd International Workshop on Traceability in Emerging Forms of Software Engineering (TESFSE'03), organised in conjunction with the 18th IEEE International Conference on Automated Software Engineering). .
Spanoudakis, G. (2002). Plausible and adaptive requirement traceability structures. ACM International Conference Proceeding Series, 27, pp. 135–142. doi:10.1145/568760.568786 . Spanoudakis, G. and Kim, H. (2002). Diagnosis of the significance of inconsistencies in object-oriented designs: A framework and its experimental evaluation. Journal of Systems and Software, 64(1), pp. 3–22. doi:10.1016/S0164-1212(02)00018-3 . Spanoudakis, G., Finkelstein, A. and Till, D. (1999). Overlaps in requirements engineering. Automated Software Engineering, 6(2), pp. 171–198. doi:10.1023/A:1008718614166 . Spanoudakis, G. and Finkelstein, A. (1997). Reconciling requirements: A method for managing interference, inconsistency and conflict. Annals of Software Engineering, 3, pp. 433–457. Spanoudakis, G., Finkelstein, A. and Emmerich, W. (1997). Viewpoints 96: International Workshop on Multiple Perspectives in Software Development - Workshop Report. Software Engineering Notes, 22(1), pp. 39–41. Spanoudakis, G. and Constantopoulos, P. (1996). Elaborating analogies from conceptual models. International Journal of Intelligent Systems, 11(11), pp. 917–974. Spanoudakis, G. and Spanoudakis, G. (1996). Analogical reuse of requirements specifications: A computational model. Applied Artificial Intelligence, 10(4), pp. 281–305. doi:10.1080/088395196118515 . Maiden, N.A.M., Spanoudakis, G. and Nissen, H.W. (1996). Multi-perspective requirements engineering within NATURE. Requirements Engineering, 1(3), pp. 157–169. doi:10.1007/BF01236425 . Dömges, R., Jacobs, S., Jarke, M., Nissen, H.W., Pohl, K., Maiden, N. … Wangler, B. (1996). Defining visions in context: Models, processes and tools for requirements engineering. Information Systems, 21(6), pp. 515–547. doi:10.1016/0306-4379(96)00026-9 . Spanoudakis, G. and Constantopoulos, P. (1995). Integrating specifications: A similarity reasoning approach. Automated Software Engineering, 2(4), pp. 311–342. doi:10.1007/BF00871803 . Belmonte Martin, A., Marinos, L., Rekleitis, E., Spanoudakis, G. and Petroulakis, N. (2015). Threat Landscape and Good Practice Guide for Software Defined Networks/5G. European Union Agency for Network and Information Security (ENISA). ISBN 978-92-9204-161-8.
d'Avila Garcez, A., Spanoudakis, G. and Zisman, A. (2003). Proceedings of ACM ESEC/FSE International Workshop on Intelligent Technologies for Software Engineering WITSE03..
2005 – present:	Associate editor, International Journal of Software Engineering and Knowledge Engineering, World Scientific Publishing, Associate Editor. 2009 – present:	Editorial Board, International Journal of Distributed Systems and Technologies, IGI Global. 2012 - present, Editorial Board, International Journal On Advances in Intelligent Systems. 2012 - present, Editorial Board, International Journal On Advances in Security. 2012 – present: Editorial Board, International Journal On Advances in Software. 2012 – present:	Editorial Board (Computer Science Domain), The Scientific World Journal. Management, ISSN: 2093-968X (Print), 2234-3687 (Online). Organiser, Industrial Experiences for Service Oriented Computing Workshop (IE4SOC). (2009). Co-chair of the 19th Int. Conf. on Software Engineering and Knowledge Engineering. (2007). Workshops co-chair of the 22nd IEEE/ACM Int. Conf. on Automated Software Engineering. (2007). Co-chair of the 18th Int. Conf. on Software Engineering and Knowledge Engineering. (2006). Workshops co-chair of the 20th IEEE Int. Conf. on Automated Software Engineering. (2005). Publication chair of the 2004 IEEE Joint Requirements Engineering Conference. (2004). Co-chair of the Int. Workshop on Intelligent Technologies in Software Engineering. (2003). 12th International Conference on Novel Approaches to Software Engineering (ENASE 2017). Chair. 13th International Conference on Novel Approaches to Software Engineering (ENASE 2018). Chair. 2014 IEEE International Workshop on Autonomic Cloud Cybersecurity,. Chair. Security Track, 6th Int. Conf. on New Technologies, Mobility and Security (NTMS 2014). Chair. 19th Int. Conf. on Software Engineering and Knowledge Engineering (SEKE 2007). Chair. 18th Int. Conf. on Software Engineering and Knowledge Engineering (SEKE 2006). Chair. Certification of Cloud Services. Bologna, Italy (2012). Presentation given at 2nd Annual Meeting of the IFIP WG on Services-Oriented Systems (WG 2.14/6.12/8.10). Bring you Own Device. (2013). Economist (Greek Edition), distributed with the newspaper "KATHIMERINI"
News programme. Hellenic Parliament TV City University London Professor of Software Engineering, Professor George Spanoudakis gave a presentation on Smart City technologies to the Research and Technology Committee of the Hellenic Parliament on 4th December. The presentation covered technologies and key research with an emphasis on security, data analytics, and the economic and social prospects arising from the emergence and use of smart city technologies. It also provided an overview of opportunities arising for R&D cooperation between the public, private, local government and academic/research sectors.